Iceberg - Officeworks Mobile Training Table Trapezoid 48W X 18D X 29H Gray/Charcoal "Product Category: Office Furniture/Meeting/Training Room Tables"
OfficeWorks Mobile Training Table Trapezoid 48w x 18d x 29h Gray/Charcoal - Functional durable mobile training tables easily reconfigure to improve meeting productivity. - Wear-resistant melamine top and perforated steel modesty panel. - Strong 1-1/2" offset dual legs for maximum legroom. - Easily mobile from room to room on 2" diameter casters. - Trapezoid shaped table. - Top Color: Gray Base Color: Charcoal Top Shape: Trapezoid Top Thickness: 3/4". 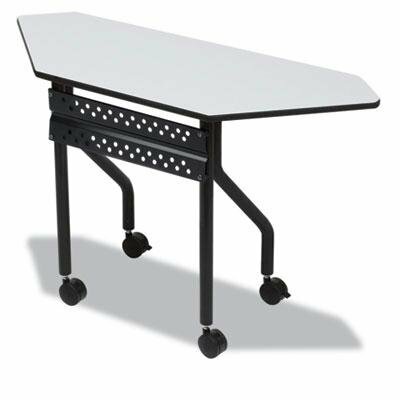 Iceberg - Officeworks Mobile Training Table Rectangular 72W X 18D X 29H Mahogany/Black "Product Category: Office Furniture/Meeting/Training Room Tables"
Iceberg - Officeworks Mobile Training Table Rectangular 72W X 18D X 29H Gray/Charcoal "Product Category: Office Furniture/Meeting/Training Room Tables"
Iceberg - Officeworks Mobile Training Table 60W X 18D X 29H Mahogany/Black "Product Category: Office Furniture/Meeting/Training Room Tables"
Iceberg - Officeworks Mobile Training Table 60W X 18D X 29H Gray/Charcoal "Product Category: Office Furniture/Meeting/Training Room Tables"